Day 1 : Arrival in Tbilisi. Meeting and greeting at the Airport, Transfer to the hotel. 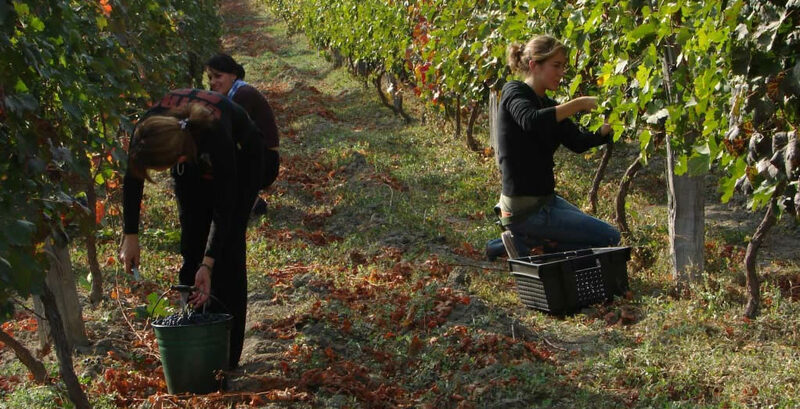 Drive to Kakheti region, where in our vineyard you will take part in the grape picking. After that, grapes will taken in our wine cellar and you'll have the opportunity to press the grapes in the fermentation tanks. At the end of activity lunch and wine tasting from our collection. After lunch drive to Sighnaghi – one of the most beautiful cities, located at the heart of Georgia's wine-growing regions. It is surrounded by defensive walls and towers, as well as its picturesque landscapes, pastel houses and narrow, cobblestone streets. From Signagi there is beautiful view on the Alazani valley, boundless space stretching to the horizon. Check in the hotel. Free time until the dinner. In “Pheasant’s Tears” we offers to tasting 4 kind of the top-class natural wines and delicious Georgian meals prepared from fresh, mainly organic and local produce, which you can enjoy. Overnight in Sighnaghi. After Breakfast at the hotel, visit Bodbe monastery. Then drive to Kvareli Khareba winery, the wine tunnels dug under the mountains of Great Caucasus. The total length of the tunnels is 8.000 m. The 2 main tunnels are more than 800 m. The tunnels are used to keep the wine for this time. Excursion and wine tasting, you'll try 4 different tape of the wine. Through the rock of the hill elevator will bring the guests up to the restaurant built above the tunnels on the top of the hill from where one can find wonderful views of the river Alazani Valley. Lunch in restaurant. After luch drive to Shukhman winery for the overnight. On the way you’ll visit Gremi fortress (XVI c). Till XVI c Gremi was the main city of Kakheti region. Check in the hotel Shukhman. Free time. Winery excursion, wine tasting and dinner in winery restourant. At the begining of the day visit the residence (now the house-museum) of most famous nobel family, poet and public figure Al.Chavchavadze, in Tsinandaly. After wine tasting visit Alaverdi monastery. Excursion in monastery - visit Alaverdi cathedral (11 c.),archaeological excavations, monastery wine cellar. Taste 3 kind of monastic wine. After lunch in the restaurant next to the monastery, visit the beekeeping farm, find a lot interesting about the bees, about their life, care for them, etc. Try and compare honey of different seasons, and at the end try honey-vodka prepared by beekeepers. Check in hotel. Free time until Dinner. Dinner. Today we have bit long drive,that why we starting tour early. Via unforgettable Gombori pass, we drive near by Sioni lake and continiu toward Ananuri Architectural complex. Fortress situated near the Zhinvali reservoir and consist two churches,(with richly decorated façades and the remains of a number of frescoes) and towers dating back to the 16th- 17th cc. After the Annanuri excursion, we continue our drive along the Georgian Military Highway and follows the picturesque Aragvi River, lunch in restaurant on the road to ski resort Gudauri. After lunch on the way to Stepantsminda, we'll pass through ski resort Gudauri, have a short stop near soviet Monument “People’s Friendship”, with wonderful viewpoint overlooking a deep gorge of mountain range, and cross the Main Caucasian Range at Jvari Pass (2395m.). Check in the hotel. Free time. Dinner. Early morning by the four-wheel drive cars, on a rough mountain road, drive-up to Gergeti Trinity Church (14 th century), situated at an elevation of 2170 meters, under Mount Kazbegi and surrounded by the vastness of nature has made it a symbol for Georgia. There you will enjoy breathtaking views. Our tour continue, we leave Stepantsminda and drive to the wonderful world of Château Mukhrani, for discover the Georgian royal family history and breath-taking legends, a flavor of antiquity and enchanting wines. The wine tasting and lunch in the restaurant “Samepo Marani 1878” (Royal Cellar 1878). with traditional Georgian dishes. After culinary journey, visit Dzalisa, one of the most significant archaeological sites of the Classical period on the territory of the kingdom of Kartli (Iberia). Inter-crossing streets and squares, public, dwelling, as well cultic buildings, adorned with outstanding mosaics, baths, water supplying system and traces of sewage system are in evidence. At the end of long day stay for the overnight in Mtskheta. Check in hotel.Free time. Dinner. Walking tour in Mtskheta, the ancient capital of eastern Georgia and still an important cultural and religious center. Mtshkheta is designated as a UNESCO World Heritage Site and is a living museum, with many architectural and historical monuments and is one of the holiest place in Georgia. Visit Svetitskhoveli Cathedral, a masterpiece of the Early Middle Ages, Svetitskhoveli is recognized by UNESCO as a World Heritage Site.The present structure was completed in 1029, although the site itself dates back to the early fourth century. On the second part of the day you'll have an opportunity to yourself distillate Chacha, compare it to the other strong alcoholic beverages, bottled it and get one bottle of as a gift. Day 8 : Tbilisi sightseeing - Cooking class - overnight in Tbilisi. Today we explore the historical part of Tbilisi with its narrow streets, colorful houses, carved balconies and magnificent atmosphere. This enchanting place illustrates a great mix of Orient and Occident. Our first destination is the Metekhi church (13th century). We can enjoy breathtaking views of the Old Town from this place. We continue walking to the Synagogue and then visit two important Georgian churches - Sioni Cathedral (6th-7th. centuries) with its beautiful bell towers, mural paintings and the oldest church of Tbilisi - Anchiskhati (6th century). Afterwards we drive up to geta panoramic view of the whole city and walk down to the Narikala Fortress (4th century). The smell of sulfur gets stronger and we approach Sulfur Baths, which delighted Dumas, Pushkin, Lermontov etc. In the afternoon we discover the stunning treasury of the Georgian historical museum, before taking a stroll along Rustaveli Avenue – the main street in Tbilisi. - Cooking class. During the master class guest themselves will cook meals and shear it to everyone. Return to Tbilisi. End of the tour. This unforgettable harvest experience includes: a visit to vineyards and wine cellars,you will be part of an exciting wine making process,you'll distillate Chacha yourself and may take one bottle as a gift, You will get a culinary class, prepare traditional Georgian meals with local ingredients, divide them with your new friends from the group and together enjoy the flavors and aromas of Georgia. Easy 10 day trip, upon the request can organize in any date from 15 of September to 15 October.